By Ayesha Khan for Architectural Digest. 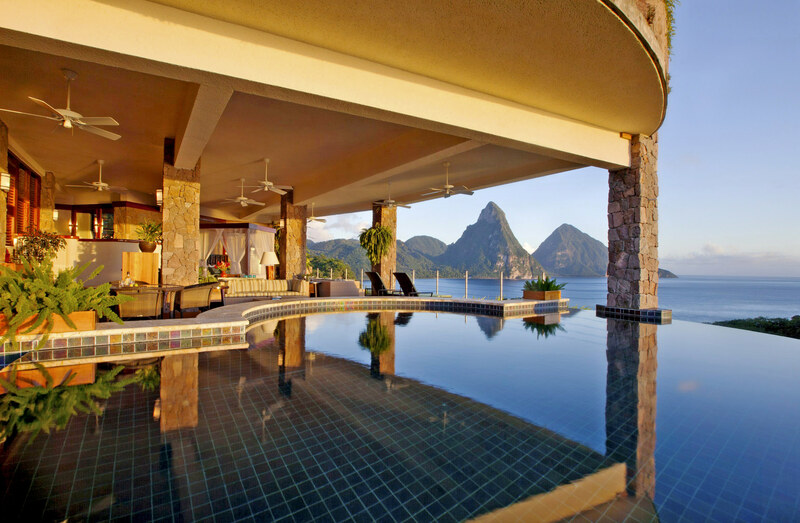 Architect and hotelier Nick Troubetzkoy eliminated the fourth wall from every room at this Caribbean paradise so guests can enjoy the picture-perfect views of the Petit and Gros Piton mountains, which are reflected in infinity pools that grace almost every room. Ecology was a priority for Troubetzkoy, who tapped recycled-glass-tile maker David Knox to clad the resort's pools and other key design features in handcrafted iridescent tiles of all hues. From $1,185/night; www.jademountain.com. 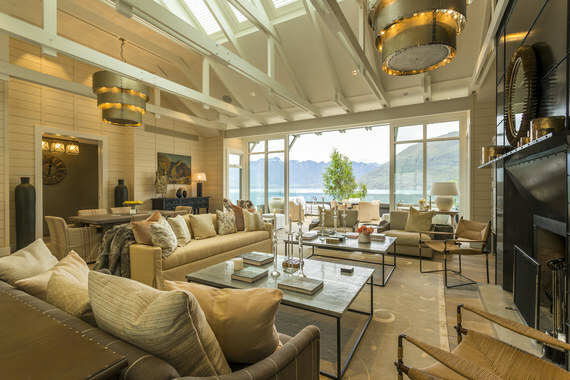 The interiors of the four-bedroom Owner's Cottage on South Island feature rustic wide-plank wooden floors, locally sourced furniture, and New Zealand wool carpets. Rooms have expansive views of Lake Wakatipu and the Remarkables mountain range beyond. From $865/night; matakaurilodge.com. 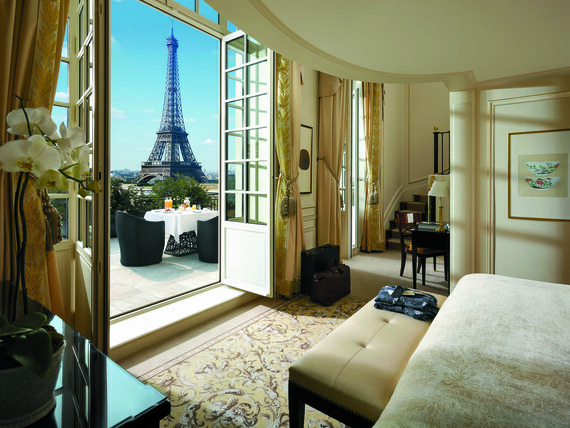 Situated just across the Seine from the City of Light's beloved Eiffel Tower, the Shangri-La takes its decorative cues from France's Empire period, courtesy of interior designer Pierre-Yves Rochon. Shown is the view from the Eiffel Duplex Terrace Suite. 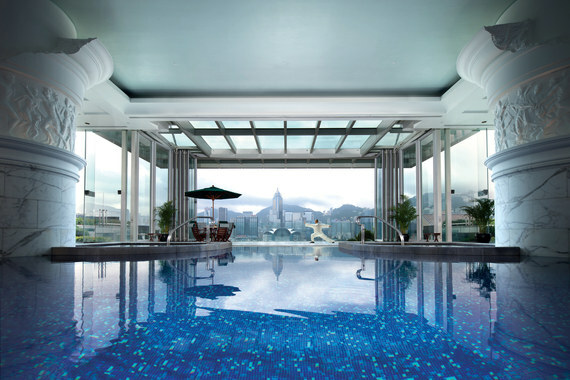 From $853/night; shangri-la.com. 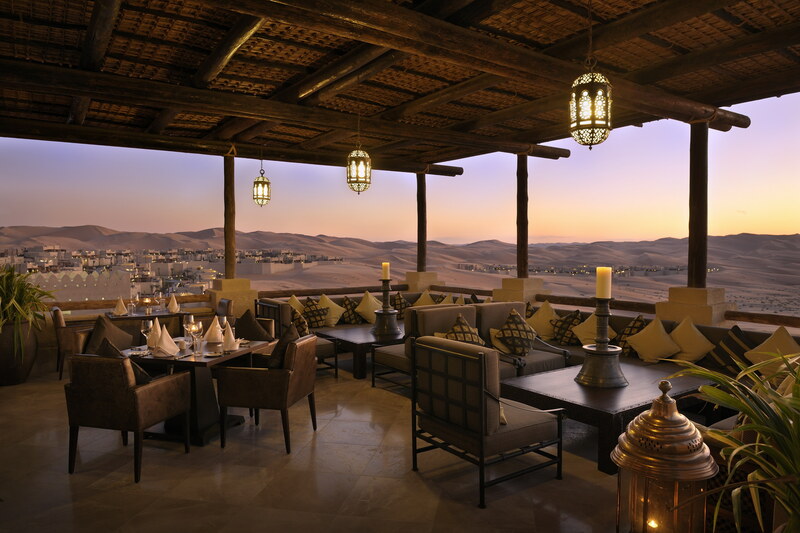 Located at the cusp of the Empty Quarter--the largest uninterrupted stretch of desert on the planet--rooms at this stylish resort contain locally sourced Arabian fabrics and artifacts. From $350/night; anantara.com. Though magnificent views of the skyline can be had from throughout this hotel on the tip of the Kowloon Peninsula, perhaps the most striking is the one from the indoor pool. This Greco-Roman example has columns and statues hewn of Italian marble, elaborate friezes, cornices befitting a palazzo, and a waterfall. From $754/night; peninsula.com. Located just 650 yards from the revered Taj Mahal, this hotel's decor is a tribute to Mughal and Moorish architecture and features lavish filigree and marble inlays, wood carvings, and handwoven tapestries. 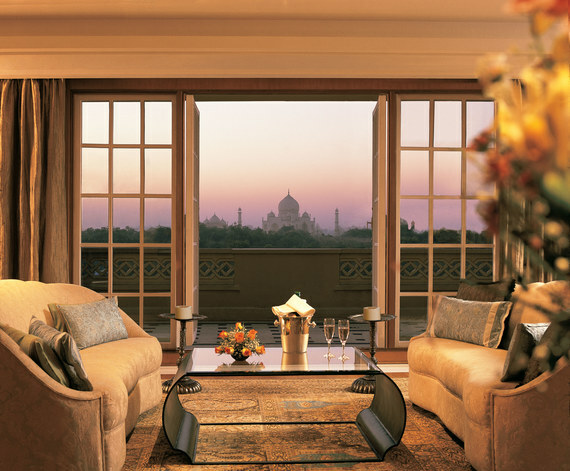 From $700/night; oberoihotels.com. Housed in an 11th-century palace perched on the cliffs of the Amalfi Coast, the hotel features intricate frescoes and carefully restored period details. An infinity pool overlooking the Mediterranean makes for a truly unforgettable experience. 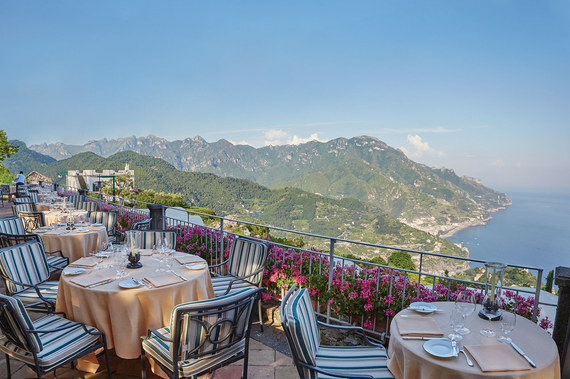 From $537/night; belmond.com. Originally the site of a modest two-bedroom log cabin built in 1890 to attract visitors passing by train to the Banff Springs Hotel, the chateau's current iteration dates to 1911. 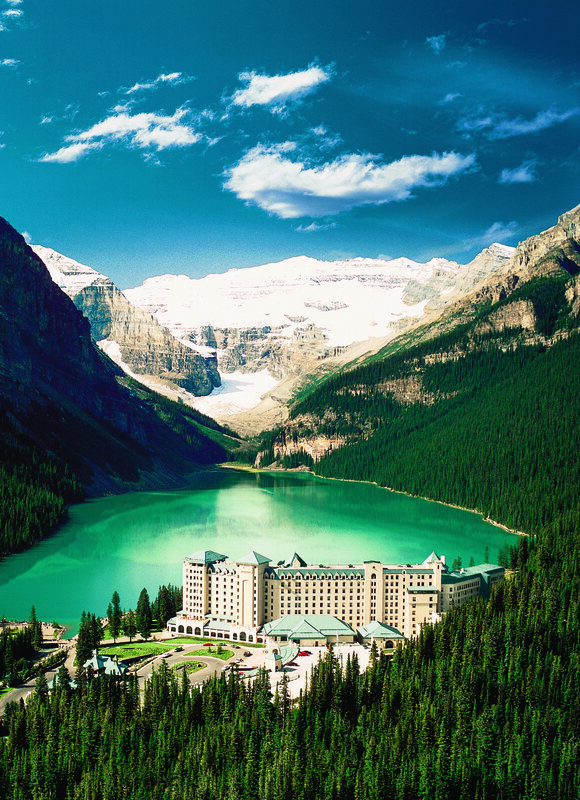 Inside, alpine-style interiors are paired with oversize windows that reveal one of the most picturesque views of Lake Louise and the Canadian Rockies. From $232/night; fairmont.com. Architects Marwan Al-Sayed, Wendell Burnette, and Rick Joy conceived this desert marvel, which seems to emerge from its rocky environs rather than overpower them. Furniture and color palettes are kept minimal, and strategically placed skylights and windows throughout the resort make the surrounding slot canyons a critical part of the design. From $1,200/night; aman.com. The dramatic design of Tierra Patagonia was a collaboration between Chilean architects Cazú Zegers, Roberto Benavente, and Rodrigo Ferrer. The team tapped into nearby sustainable forests to construct the mostly wood structure, envisioning the building as a fossil emerging from Lake Sarmiento. They drew on the talents of local craftsmen for the unique furniture and artifacts that define the interiors. 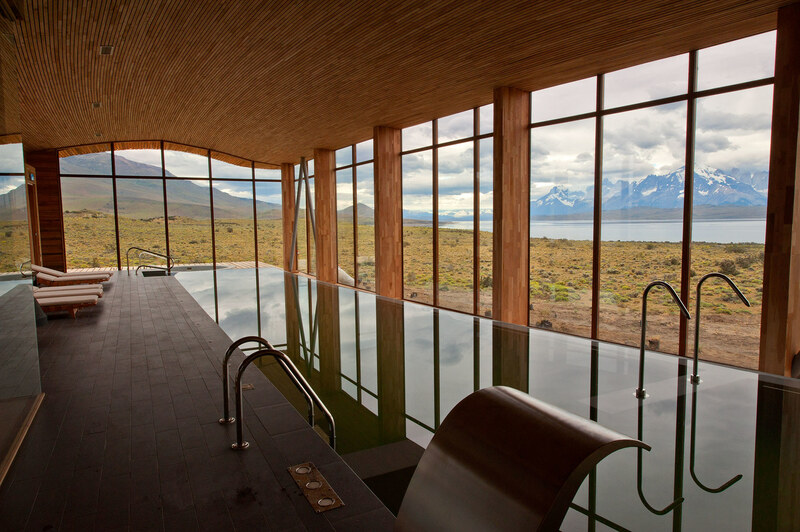 Large glass expanses showcase the stunning views of the lake and the peaks of Torres del Paine National Park. From $833 per person/night (all-inclusive); tierrahotels.com.